In about 30 minutes from start to finish you can have beautiful Herb Roast Chicken from your Air Fryer. 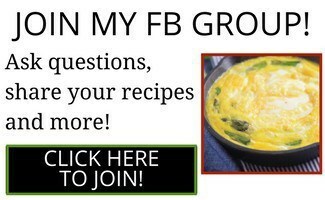 It’s full of flavor and is quick and easy, you will want to make this weekly. This Herb Roast Chicken tastes like it’s been marinating forever in the fridge, and infused with all kinds herbs and spices, but it’s stupid simple. 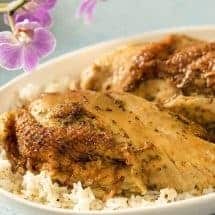 This recipe uses spices you probably already have in your pantry, so you can rest easy that if you have chicken you have the ingredients you need to make this recipe. It’s perfect served with rice, but can be served with veggies or so many other side dishes to make it a complete meal as well. The air fryer makes the most crispy chicken with so little oil, and I love to cook my chicken in it. Just look at the beautiful golden color the chicken gets! The chicken cooks quickly so it stays juicy, so you get crispy skin and juicy meat which is the perfect combo. 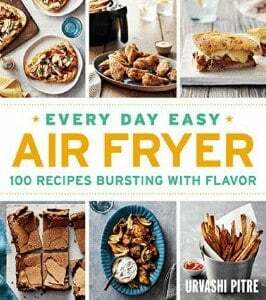 But the one thing to note is that it’s actually difficult to make dry meats in the air fryer and get them to taste good. 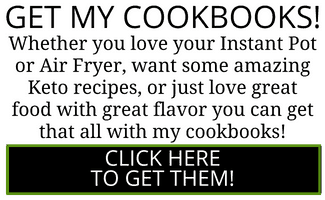 So for this recipe, I wanted to see about making chicken breast in the air fryer without drying it out. You MUST leave the skin on! Do NOT take the skin off when cooking. If you don’t want to eat it afterward, you can take it off. But allow it to cook with the skin on so you get some natural basting from that chicken skin. Also, be sure to use a meat thermometer so you aren’t overcooking the chicken. If you overcook it, it will definitely dry out. Feel free to spray with oil while cooking to keep the surface moist and evenly browning if you need. The herbs and spices used in this are paprika, thyme, rosemary, garlic powder and salt and pepper. Simple right? 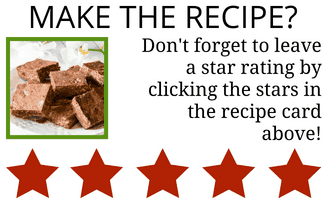 Combine that with butter and some lemon wedges and that’s really all you need to make this recipe. 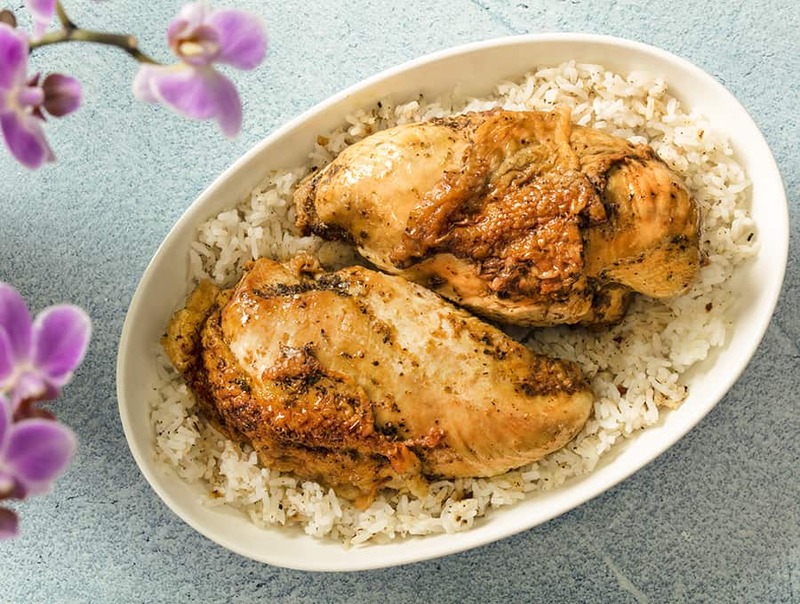 Classic Herb Roast Chicken in very little time that comes out perfect in the air fryer. LOOKING FOR MORE DELICIOUS AND CRISPY CHICKEN RECIPES? TRY MY AIR FRIED BREADED CHICKEN WINGS RECIPE! 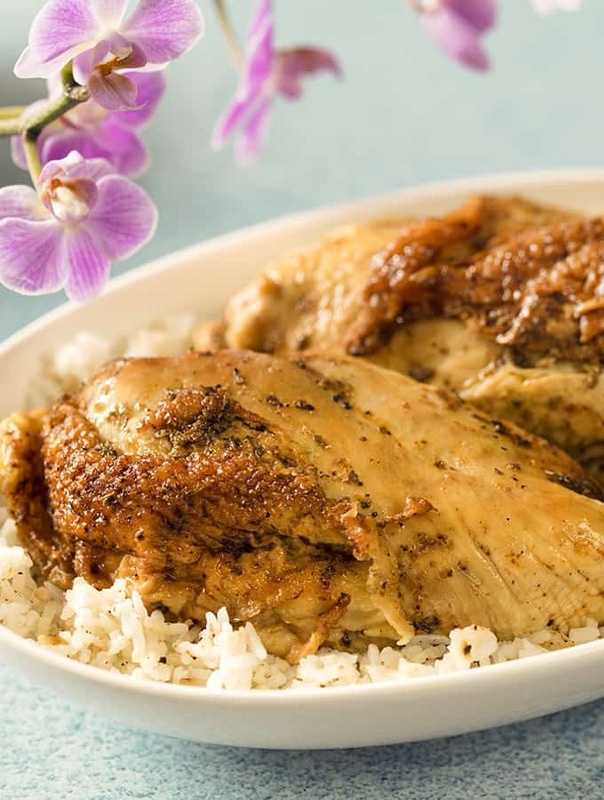 Herb Roast Chicken turns out amazing with this recipe designed for the air fryer. All the traditional flavors you want, with none of the fuss! In a small bowl combine butter, salt, paprika, thyme, rosemary, garlic powder, and black pepper. Stir until thoroughly combined. Using a small sharp knife, carefully loosen the skin on each breast half, starting at the thin end of each half. Very carefully separate the skin from flesh, leaving skin attached at thick end of each breast. Divide herb butter into quarters. Rub one-quarter of the butter onto the flesh of each breast. Fold and lightly press skin back onto each breast. Rub remaining butter onto skin of each breast. Place chicken in air fryer basket. Set fryer to 375°F for 25 minutes. At end of cook time, use a meat thermometer to ensure the chicken has reached an internal temperature of 165°F. Let chicken rest for 5 to 10 minutes. Serve with lemon wedges.